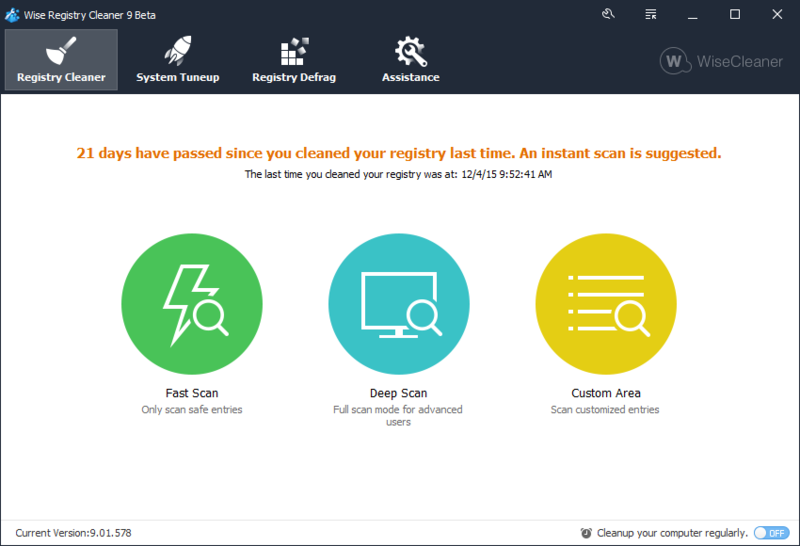 Wise Registry Cleaner 9 is released the Beta version. Try it now before its official release. Click Here to try WRC 9. ​1, Fixed the issue in Export report. It seems WRC has got the same complicated interface of WDC. I'll repeat: honestly I prefer the current interface (WRC 8), because I can use the mouse wheel to scroll the screen. 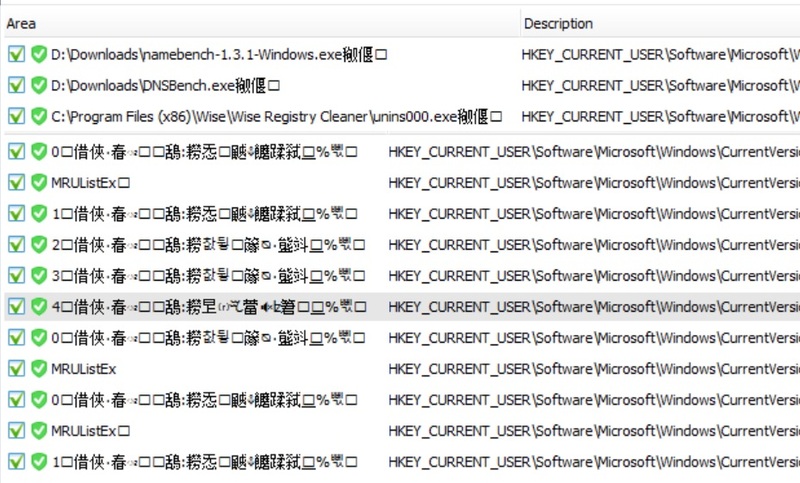 Unnecessary function Optimization Tune UP - computer started to go worse. I believe that this function should be only in Wisecare 365. In general, this function does not fit into this type of program. It proposes to add a search engine entries in the registry and replace instead of Tune Up. First, WRC8 is using the Default Scan, but WRC9 (the Fast Scan) is using the Safe Scan. we have improved the scan speed, please try the new beta version. Can you give me some screenshots? I have used deep scan with both: same computer and same conditions. By the way, improving the speed is always good. Edit 01/01/2016: Tried it now, WRC8 took 2min18s, WRC9 took 2min12s. I found the borders are still too little. When WRC8 and WRC9 finish their scans, I open "application paths" in both. You can see the first shows only Chinese ideograms, the second shows also European characters (code page 1252?). Actually, these unreadable characters neither are Chinese nor other languages. You can click one then click Open in register editor, its type is Reg_Binary, if you double click it, you will see many unreadable characters in the Value data area. So, this is not a display issue of WRC, but we will improve it, just display the key's name without its value. Yes, but something changed in the program because WRC8 didn't read the value, instead WRC9 can read it. That's why I have put it in the PRO's. Another little problem in the new interface, after a scan: when changing language, strings remain with the previous language. When I hover the cursor over them, the language changes. The program does not check the current beta. After checking the program showed that the current version. After downloading today, the version number was higher. The same is true in Wise Disk Cleaner beta. But, I can't understand you clearly. Do you means (check update) the current version 8.81 can't check out the beta version 9.01? or, what else? Check for updates is disabled, it will be enabled hen the official version is released. But why "safe to scan" and deep / advanced are devided? ... safe isn't safe about deep? Deep scan may delete any needed entries, but not a must. It is best to check what has been detected to be deleted. This program so and so is the best. Does not remove the entries that other programs cause, after erasing the system errors. Consider also old suggestions here (click). Especially, adding ctrl+click, shift+click, arrows and shift+arrows (on the keyboard) to select entries to be ignored or to be deleted: your competitors have them. After the opening WRC 9 and WDC 9 shows the same unread threads help. Safe Scan, Only scan and list the safe entries in scan result list. This is recommended. Deep Scan, Scan and list all entries, even though some may not be fully safe to fix. It is for advanced user. We do not advise user to delete registry backup, so, if you want do it, you should delete it one by one. It can avoid accidental deletion all backup.